We are taking a quick break from our European Winter Road Trip recap to have a moment for New York City. I spent last week in Manhattan for work and used every spare second to explore. As it turned out, Ty just so happened to be traveling for business on the East Coast and met me in the city one night and then again for the weekend. This was the first time we’ve spent a substantial amount of time here, and we absolutely loved it. It goes without saying that Manhattan is huge. It could take a lifetime to fully uncover all of the hidden gems this city has to offer. But we wanted to report back on the time we spent here even though we know that we barely scratched the surface. This list may be very elementary/obvious/touristy/limited, but it’s a good start if you are visiting for the first time. We’d like to take a second to thank all of our friends who took the time to send us their recommendations (I’d also like to thank the other travel bloggers I stalk. Also Gossip Girl). But first, a few logistics. You can fly into LaGuardia, Newark, or JFK. We learned that all three are about the same distance from Manhattan, depending on where you are staying and the time of day. Go with whichever airport you can get the cheapest flight into. As far as lodging goes, stay away from the Midtown/Times Square area. We made this mistake on the weekend, thinking it would make the most sense to stay in a central location. However, Midtown ended up being our least favorite part of Manhattan – it was crowded and gross, the two things people hate about New York. We did really love our stay at the EVEN Hotel, but next time we will probably look for lodging in a cuter area. We’d recommend just picking a neighborhood (the West Village is adorable, and I loved Chelsea) that suits your fancy and muster up some courage to master the subway system. Sidenote: This post was getting way too long, so we decided to do all of the food stuff in a separate post. Because if you can focus on just food for 900 words, why wouldn’t you? Another disclaimer – we’re sorry, but we didn’t make it Brooklyn this time around. We will go another time, we promise. Check out TodayTix for discounted, last minute prices on tickets to almost every Broadway show (except, you guessed it, Hamilton – you can drop a grand for those or test your luck at the in-person or online lottery). We bought mezzanine tickets to Wicked for $100 each, and it was INCREDIBLE. Yes, it was my third time seeing it (never before on Broadway), but I had an inkling that Tyler would appreciate Wicked more than Phantom of the Opera. Fast forward to two weeks later, he is still aggressively humming “Defying Gravity,” and I even spotted him listening to “For Good” through his precious AirPods the other day. On your way to the show, use the opportunity to quickly walk through Times Square – a place that is fun to see but not fun to be in for more than 5 minutes. We know how obvious this one is, but Central Park really is so beautiful. We went through the entrance by the Plaza Hotel and walked through to the 79th St. transverse and then out to the Upper East Side. There is something for everyone here. 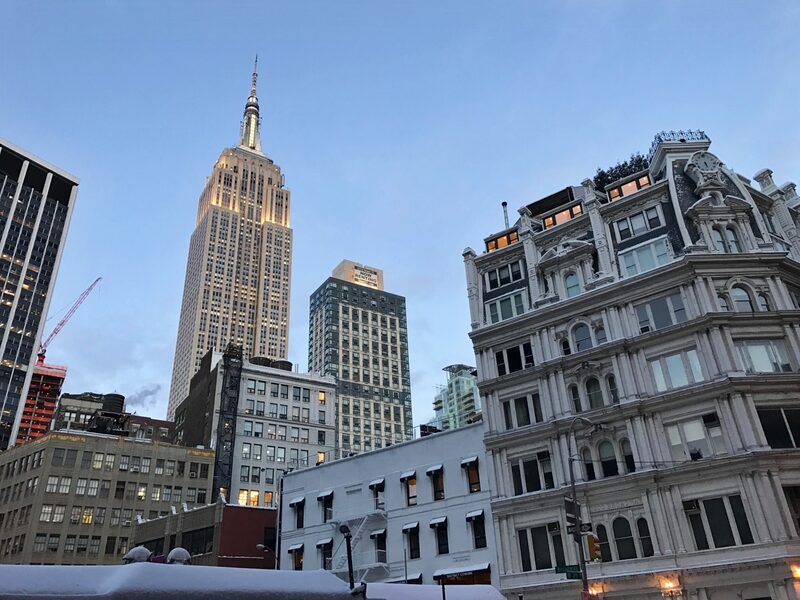 You can check out the zoo, lounge or picnic in Sheep Meadow, ice skate at Wollman Rink (though many argue that the rink at Rockefeller Center is the best in the city), or walk through the Conservatory Garden. This is a must if you are at all coordinated enough to operate a bicycle. You can easily reserve and rent bikes using the Citi Bike app on your phone and pick up a bike at any of the stations around the city (you can also just reserve and pay for it right at a kiosk at the bike station). There are stations literally ALL over Manhattan. Get a day pass for $12 or a 48-hour pass for $24. We picked up our bikes at one of the Citi Bike stations at Riverside Park and rode down the Manhattan Waterfront Greenway to a station near the 9/11 Memorial (a little over 7 miles). If we had ridden just a bit farther, we would have made it to Battery Park which is a cool spot from which to see the Statue of Liberty. This was such a fun way to see the city (and I really needed the exercise). It’s 100% worth the trek downtown to see the 9/11 Memorial. The memorial itself consists of two huge pools of water, each signifying one of the twin towers with the victim’s names etched around the sides. It is one of the most stunning and powerful things we’ve seen. It was really humbling to see this memorial because we remember so vividly when 9/11 happened. The memorial itself is free, and the museum costs $24 for adults. This is also a really fun way to see the city. The High Line is a 1.45 mile long park located on top of an elevated old railway. We recommend starting on the north side and making your way south. If you are freezing like we were, hop off and grab a coffee at the High Line Hotel. Then, finish up your walk at Chelsea Market (more on this piece of heaven in our next post). After stuffing yourself with gourmet (what we call gourmet anyway) fare at Chelsea Market, head up a few blocks to the Golf Club at Chelsea Piers. We did this because it had started raining like crazy, and there is only so much precipitation I can take. The stalls are fully covered and heated, so it’s the perfect “outdoorsy” thing to do on a rainy day in the city. Tyler was over the moon. I don’t think I’ve ever seen him happier than when he was hitting golf balls into the Hudson River. Unfortunately, we didn’t have time to visit any of the museums (we know, we know), but we definitely plan on hitting a couple the next time we are in town. A few on the top of our list are MoMA, the Met, and the American Museum of Natural History.